Discussion in 'Guitars in General' started by Tommy Tourbus, Sep 14, 2008. I'm guessing that's the "treble bypass cap", so that when you roll back on the volume knob, you maintain treble. That's an Esquire kit not a Tele you are showing, so that small cap fakes the neck pickup sound. There's all kinds of things you can do with a cap. A treble bleed circuit for instance. you can also put shock protection in your guitar with a certain kind of wiring. For instance, when you're playing and the microphone stocks you when your lips touch it. 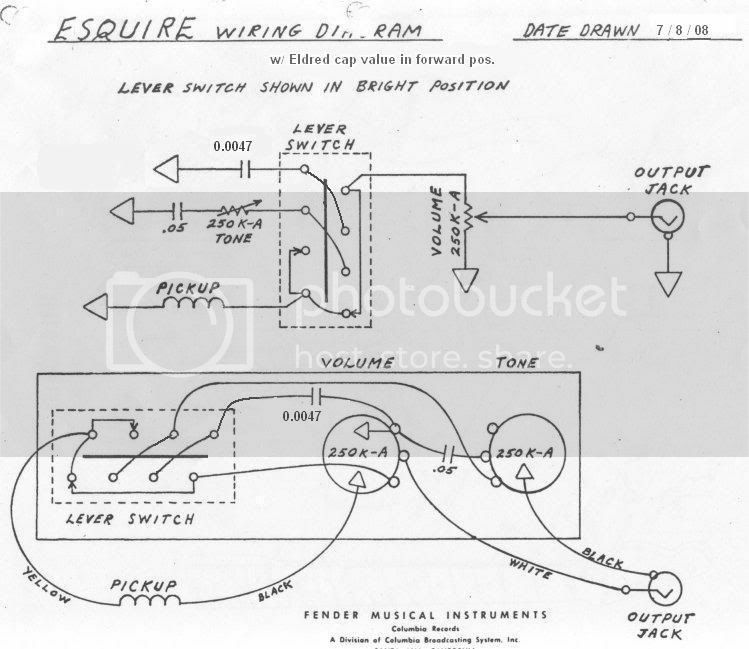 Here is a diagram showing whats going on in that style esquire wiring. so the extra cap, the .05 cap, is only needed in a single pickup config? If I'm not mistaken old tele's ( I don't know what years) were wired with a cap on the neck pickup so it had the sound of the tone knob rolled off. I believe this was done in an effort to really establish the neck pickup as a rythm pickup and fatten the sound even more which in turn made the bridge pickup seem like it was screaming when you switched over for a lead.